Almost a year after completing his studies in the BFA in Digital Art and Animation program, 2013 DigiPen graduate Matt Cangelosi has received some newfound attention for his student work. In February, his senior capstone project, a 2D hand-drawn animation titled Beneath the Night Sea, won the prize for Best Animation at DAFNE (formerly the Digital Arts Festival) in Redmond. The animated short was also recently showcased on the Student Animations website, along with a special interview about the making of the project. Without words or dialogue, the animation tells the story of a young girl living in a cold, underwater city. Alone and longing for warmth, the girl catches a glimpse of a brighter world above when a bloom of jellyfish lights up her surroundings. From the earliest planning stages during his junior year, Cangelosi says he was interested in creating a story that involved an underwater city and jellyfish. Finding a theme that could tie the two together, however, proved difficult. Cangelosi eventually found his inspiration while visiting home for Christmas. Feeling for his mother’s dilemma, Cangelosi says he got to thinking about what it would be like to live in a state of unending coldness, and what it would take to make someone in that condition feel warm. From there, a theme of contrasting cold and warmth emerged. 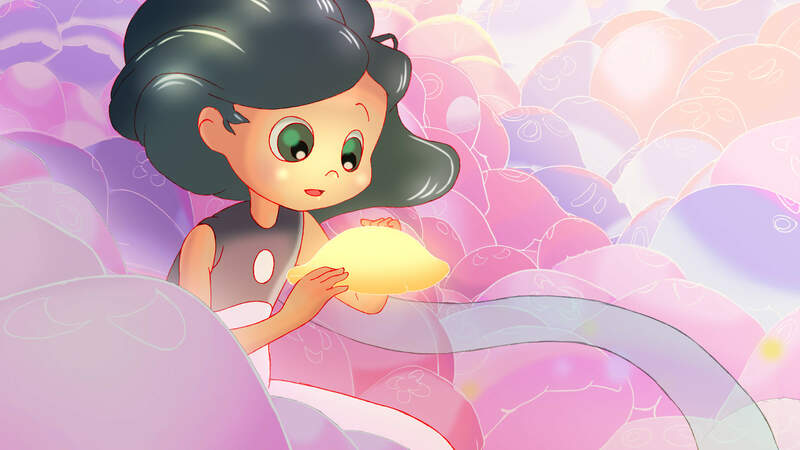 After nailing down the basic story outline, Cangelosi spent over a year bringing his vision to life, drawing out every character, background, and jellyfish frame. His final cut included 1,966 hand-drawn assets — each individually drawn on paper, scanned, and then colored in Photoshop with some additional help from fellow BFA students. He also created an additional 2,864 digital hand-drawn images for lighting and shadows, resulting in 4,830 total drawings. As a former Disney animator, DigiPen art faculty member Pamela Mathues is no stranger to the unique technical challenges of 2D hand-drawn animation. Typically, she says, DigiPen instructors don’t allow students to create a solo senior project — let alone a solo project in 2D. Because the senior capstone is intended to become a talent showpiece for presenting to industry employers, it’s important for project teams to present an idea they can reasonably accomplish. Even before the beginning of his senior year, she says, Cangelosi had his story approved, complete with storyboards, an animation test, and full color scripts. Despite the added challenges, Cangelosi says he had wanted to make a 2D film since before he decided to pursue animation as a career. What made it possible, he says, was a combination of personal motivation, guidance from professors, and a supportive community. When asked about his overall time at DigiPen, Cangelosi says the most important skill he gained was a sense of intuition. Cangelosi works as a 2D artist and animator at Cricket Moon Media in Seattle. You can check out his personal website at mattcangelosi.blogspot.com.